Jet Turbine Engine: What Now? In Schreckling's book, there is a photo of the first jet turbine he made run. The compressor section is really simple, without any diffuser vanes at all. It's nothing more than an impeller running in a plywood case with four pipes taking air to the combustion chamber. That compressor couldn't be significantly better than mine. If that engine ran, so should mine. It occurred to me that I haven't been bothering to set up a mirror to look at the spinning turbine. So I did another run. That showed me something I had missed. With the turbine spinning, I can see up past the tips of the NGV into the combustion chamber. I didn't like the colour of the flame in there. It had far too much yellow in it, especially as the gas supply is turned up. Not enough air. There is also a dramatic change when the air blower is removed and the engine begins to wind down. 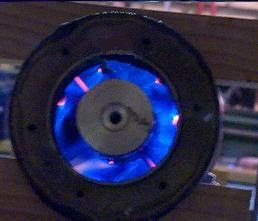 The amount of yellow increases immediately and the flame moves towards the exit of the combustion chamber. I drilled some more holes in the front section of the Combustion Chamber(CC), which seemed to help. Unfortunately, one of the injector needles got damaged during the next assembly. I need to replace it but I've run out of oxygen for my brazing kit. Well, I replaced the broken needle, widened some more holes and tried again. Better but not spectacularly so. I stripped out all the internals and just left the CC in place to have a look at the burn. Here's a picture. For this shot, Ive removed everything except the CC itself and shoved my big blower in the air intake. So I know exactly how much air is entering the casing and how fast. It's difficult to photograph this. I used a mirror. The two red glowing lines are wires that hold the chamber parts together. There is a dark spot bottom left but otherwise it's a really clean burn. You can see the tips of the injector sticks glowing bright red (there are 8 - some hidden by the angle). The dark spot is caused by two of the injector sticks being slightly off-angle. When I adjusted them it disappeared. 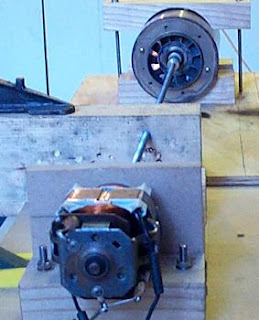 Next, I put everything together but left off the turbine wheel and instead conected a motor to drive the turbine shaft. I had to use a long driveshaft to keep the motor out of the exhaust. Here's a shot of the test. The motor is running and the flame is lit. You can see the flame inside the combustion chamber through the NGV assembly - It's quite yellow, indicating not enough air. I have to go back to the test rig and see if I can't 'tweak' it to give more information.